Due to popularity of events, please let us know, in advance, if you would like us to purchase tickets for you. We will be reopening May 1, 2019. Check out 'News & Events' for our U-B-Que Dinners served in the Mill House restaurnt, Thurs. - Sat. Where it is all about the experience! The Saturna Lodge is a character-filled property offering comfortable accommodations, with The Mill House resturant serving wonderful breakfast and dinner. 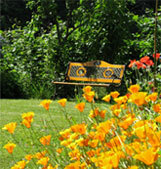 It is a wonderful place to shed the stress of hectic urban lifestyles, whether by simply relaxing -- in our garden, on our lovely view deck or resting in the lulling swing -- or through some healthy Saturna exertion: hiking, biking, kayaking, birding, etc. The Lodge is also a perfect place to host a special occasion, reunion, retreat or corporate meeting. 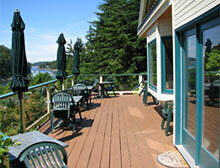 Saturna is the most pristine and least developed of the main southern Gulf Islands. A small, close-knit community shares the island's natural glories with a growing number of enlightened visitors. Almost half the island (and much of the off-shore area) is protected as part of the Gulf Islands National Park Reserve. From land, you can drive to East Point and watch the whales and other sea life pass by. Via car, bike or foot you can reach the top of Mt Warburton Pike to see the vast views and feral goats. There are lots of things to keep you busy! 2016 - New York Times Lists the Gulf Islands as one of the Top 50 places to see in the world.